I knew this was going to be difficult. I have lots of patterns – over 100, and then maybe 40 self drafted ones too. Some are old and “valuable”, some are new and never used. Many I got for £1 or so on eBay. However my patterns, just like my fabrics, are pretty important to me. Maybe they even get into the “sentimental” category. They represent quite alot of thought. They bring me joy. Some are rather beautiful. Many are nearly as old as I am, and some are older than me. They smell a bit funny; they have a history; they tell a story. Therefore I have been avoiding this job for weeks. Here they all are, pulled down and placed on the floor. What does Kondo tell us about sentimental items? She says they are the most difficult, so leave them until the end. I guess I am getting to the end of sorting out my home (and office), so I have finally to face this. I have some genuinely sentimental items. A card my mother sent me when I got my job saying some lovely things. The funeral Order of Service from when my brother died. Photos from weddings and christenings of family members, and lots from when the children were babies. A letter to my father about some boots from the war. A couple of very genuine Mothers’ day, or birthday cards, mainly from my children (when they say thank you, it means so much). I will hang on to these consciously and store them in a special place. Vintage patterns and books are not in the same category. But…. Kondo also has a strong view on “storage solutions”. I agree with her that these items (think Ikea, Lakeland, Muji – boxes, cartons, things that live under the bed) are such an attractive notion, but are actually excuse for hoarding! You put your items n the storage solution and feel in control. But it is not true! 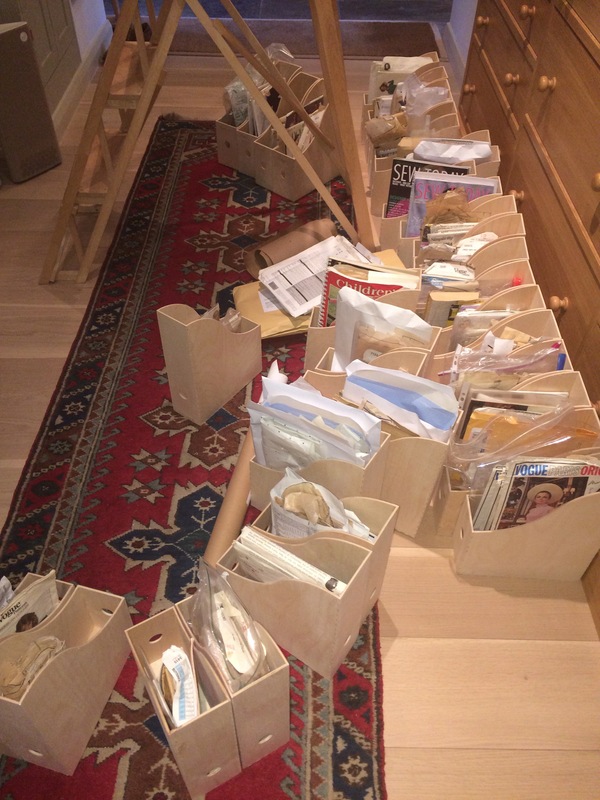 I have nearly all my patterns in storage solutions, designed or purchased by my husband (who is a little bit of a hoarder himself, if I tell the truth). I guess he was feeling overwhelmed by the patterns and wanted them to look tidy. So here Nick’s storage solution. He ordered matching wooden “magazine boxes” on-line and assembled them. They normally live on the top of the cupboard, where they are slightly out of sight. I have to use a step ladder to reach them. I can often, but not always, find what I want because I have labelled them fairly well eg 1950s coats, Menswear, Lingerie, DVF, etc. In fact I always slightly surprise myself when I retrieve exactly what I want. But I managed to misplace the pattern for Gus’s jacket for about a year, meaning I couldn’t line and complete it. I decided to stick with this method of storage because I just don’t have another one available. I found one box labelled “won’t fit back in the packet”. This is one of my bugbears. If I make alterations, introducing strips of paper to lengthen or enlarge a pattern, it is often impossible to get the pattern back into the packet. These, after all, are my TNT patterns that I have altered to fit, generally rely on and will go back to. What do you do about this problem? I have been known to remove all the alterations and stick the pattern back together, but that seems stupid. Generally I shove what I can into the envelope, making it look like an ice-cream cornet, plus any overspill, into a large white envelope on to which I write a brief description (“1950s SWAP coat”, in this case). Not very pretty and not that good for immediate identification. Also in time the original pattern envelope splits. A better solution (for my more valuable patterns) is to put the pattern envelope, and the pieces separately into a clear plastic envelope with a press stud or zip (another “storage solution”). A Betty Draper suit, size 18, and more…. Obviously libraries use a classification system in order to ensure that anyone can find a particular book. I need a classification system for my patterns, and this has troubled me. Patterns can be defined by a range of issues eg. In the end I adopted a hybrid approach. I have two broad categories – Vintage and Modern. Modern includes all the new patterns (post 1980s), self drafted, etc. 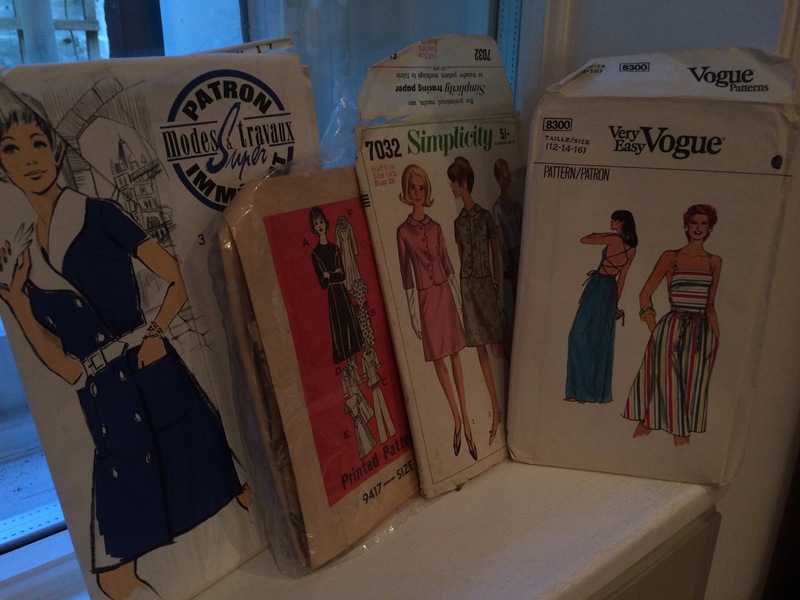 These are broadly broken down by item type, designer (DVF, Geoffrey Beene) or pattern company. These live on the top of my cupboard. 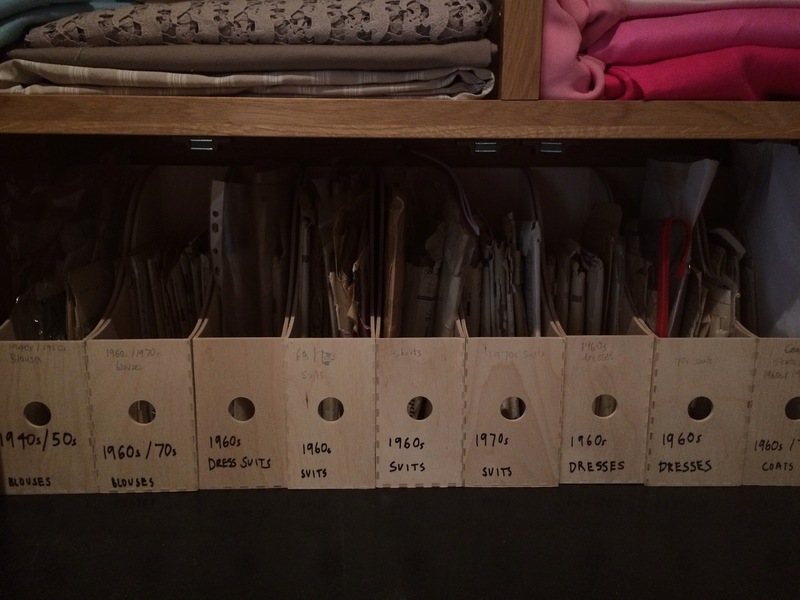 Vintage patterns are arranged basically by date, subdivided by item type. However a few are arranged by pattern company – I have about 15 Vogue Pattern Originals, and a few similar patterns from other ears. These are the “valuable” patterns in my collection that I treat with a bit more respect, so I have segregated them. My boxes have pencil descriptions on them – tellingly provisional, as if the collection would keep expanding. I decided today that I don’t need any more patterns. Consequently I committed to the categories by using a black felt tip to write on the boxes. When I Kondoed my fabric collection, I concluded that I had bought enough. When I Kondoed my dressmaking patterns, I felt the same. There are enough here to last a life time. Most dress, coat, trouser etc styles that suit me are represented here. I have lots of suit patterns, lots from the 1960s and 1970s, especially dresses. I can say that I would wear every pattern I have (I kept three maternity patterns in case of further grandbabies). However I could discard all my patterns. It wouldn’t stop me sewing. Maybe it would be refreshing to start each project anew. Buying, downloading or even drafting a pattern is not the most difficult thing in the world. The downloading approach is quite handy. I already feel free to discard my Burdas as they can be downloaded again, free of charge. In fact in my ideal world all patterns would be digital, especially if we could find an easy way of saving alterations. I own very few novels precisely because I can always down load one or buy second hand on Amazon. Personally I look forward to the day when dress making patterns are all downloadable. I’m feeling a twinge of panic Kate. My Mum was a collector of, well, collectibles. I had no time for such trivia. But with age I’ve come to cherish certain things. ‘Things’ are at their most vulnerable 30 years after their debut. That’s when ‘things’ are at their least desirable. I’m just not convinced our history is being curated. What will our kids have to remember us by. What will our kids have to remember their great grandparents by? I love to show my kids the patterns their great grandmar made for their father and they get such a kick out of surveying the ephemera of ‘the olden days’. What does Kondo say about curating history I wonder? An interesting question Lesley! She is silent on the curation issue except that she says you should keep what you love. I think that is a reasonable starting point. If you value something enough to cherish it, to bring it out, to talk to your children about it and celebrate the object then I think she would say – great, find a home for it and really value it. If the item just shoved in a cupboard and you forgot you had it then maybe give or throw it away. For example she says – go through your photographs – select the best ones and keep just these. I guess you could frame them, make albums for your kids and parents, or (as I hope to do) scan them so they can be printed off if you ever want them. I have a huge basket of photos I am going to have to deal with. In terms of preservation – obviously what survives is to some extent luck. I used to have a “history of costume” collection with items from every decade of the last century that I thought I might use as a teaching aid. But in the end I let it all go as I realised that our museums provide far better examples, are looked after by professionals and can normally be visited free of charge. In addition, of course, digitalisation and the internet allows me to really examine old pieces of fabric and garments through the ages. Maybe not in enormous depth, but I could go to the V&A and ask to look if I really wanted to. Call me superficial but I like a little bit of knowledge about lots of things rather than a PhD on, say, Flapper Fashions. First let me say that my phone is evil and never lets me comment on your posts, so please, about 4 hours after you post something, know that i am nodding and saying ‘oh, indeed’ and making Bruderlein look at your pictures. Now, I am married to a hoarder in training. Its an interesting balance because can toss things with no remorse. I’ve avoided Kondo because I’m afraid I’d enjoy it too much. Especially if it were his stuff! Ha ha. I love your comments above all others as you are the funniest girl in B movies. I love the idea of you forcing Bruderlein to look at my photographs…. It is hard when the person you live with has such a different view on what they need (Me one or two pans, Him – pans for everything from milk pan, egg pan, pancake pan, frying pan, wok, rice cooker, sauce pan, soup pan, pan that steams vegetables in tiers, pressure cooker, pasta cooking pan, huge pan for salt beef, fish shaped fish kettle, jam making pan and so on). “won’t fit in the packet” – that must be the greatest label ever. Some great tips for those us just beginning to sew (for the first or last time). Call me crazy, but I’ve been so looking forward to stacks of patterns and fabrics. I have 2 shelves dedicated to my new “collections”. However, reading this reminds me to be diligent about proper storage and labelling. Right now I have one pattern and two pieces of identical fabric – should be easy, right? Because everything I make requires so many alterations, anything I have used would wind up in the “won’t fit in the packet” category. What I do is transfer the pattern immediately to a bigger envelope, and attach the pattern envelope to the outside. Now that I have the Wild ginger software, I won’t be buying patterns anymore for the most part, but the patterns I generate with the software can go into those same style of envelopes. I just need to work out how to get a photo or drawing on the outside. I am impressed with your major cleanout and have been inspired to buy and start reading the Kondo book. Thank you Maggie – that sounds like a good solution. I am keen to read more about your experiments with the Wild Ginger software and how you produce and store the patterns. Although my pattern stash is much smaller than yours (30? ), so much of what you say rings true. I have been treated by Damon to ‘really useful boxes’ so as to be able to store my store patterns conveniently (out of sight). I used to use wire coat hangers for storing self-drafted patterns (a single hole punched through all the sheets) but that got messy as they grew. As they were hung up near the iron, they started to look like a fire trap too! I now fold them inside ‘pocket wallets’ and into a Lever Archer file but they’re few. Some lovely looking patterns (from the 60s and 70s) which have a funny smell were given to me by Damon’s mother – I guess that was her hoard dispatched with. Like my books that I insist on keeping but will probably never re-read as I’m always hungrier for what’s new, I realise they’re just a few years away from recycling/charity shop but I keep them as they’re not yet troublesome enough. I tend to trace all my patterns off so end up with original pattern then the traced off in a A5 envelope. I need to sort and like the idea of the clear wallets with the press stud closure. I also really need to sort through photos. In the time of prints I’d get my 24 / 36 back from the chemist and only put the good ones in the album the rest would get chucked. I would store the negatives safely if I ever needed a reprint but now I have hundreds on the PC. I want to go through and delete what isn’t needed and back up safely. I read Kondo in Jan this year and I loved the book. I cringed at the part where she ripped favourite pages from books though..not sure I can go the full monty with Kondo but I picked up a lot of valueable tricks. I now have to sort out my sewing cave! Having recently tossed about 250 patterns, I can sympathize with any angst this project entailed. Like you, I have decided that I really don’t need any more patterns, unless they are quite unique and I will really make them. After a while, if you have been collecting for years, you have the styles all pretty much covered and just need to alter for the current style aberrations. I keep mine sorted by garment type, with each its box. The only exception to that is all my Issey Miyake patterns and Vogue designer originals. They are special snowflakes with their own boxes. I agree that there is not much new under the sun, or if there is it doesn’t usually appeal to me. I also love some of the Vogue designer patterns and it is nice to get to know one or two designers intimately by making a few of their outfits, isn’t it? Hi Kate Betty Draper wants to come home to Australia! I’ve completely given up obsessing about how much sewing stuff I have.